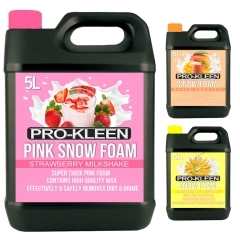 Pro-Kleen’s super effective coloured Snow Foam gives you an unbeatable car-cleaning performance every time. It breaks down stubborn dirt and traffic film on from your car’s paintwork thanks to its ultra-thick foam and powerful cleaning formula, meaning any follow-up contact washes leave your car’s paintjob with a mirror shine. Snow foaming your car is always satisfying, and our range of coloured Snow Foam will add an extra splash of colour to your car cleaning routine! Choose between pink strawberry, yellow banana milkshake, and an orange mango smoothie fragrance to put the fun back into detailing. It makes for a superbly clean car and a brilliant Instagram photo! Pro-Kleen Snow Foam is specially formulated to give you the thickest snow foam every single time. This means it’s in contact with the surface of your car for longer, so it lifts off more dirt and gives a shiner finish to your paintwork! It has so much cleaning power that you might find it cleans all the dirt from your car almost entirely, making follow-up wash and wax treatments quick and easy. 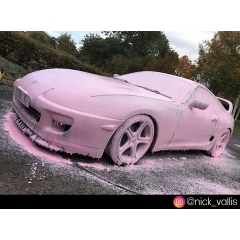 For best results, use our coloured Snow Foam with a Pro-Kleen Snow Foam Lance. The two are designed to work together perfectly, and will give you thick snow foam and a gleaming car with every use! To learn more about our range of Snow Foam Lances, click here! If you want to learn more about what snow foam is and how it works, read our beginner’s guide to snow foam!